This house comes assembled, and made from superior baltic birch with milled siding instead of the more common MDF. It includes the windows and door shown, plus interior staircase. 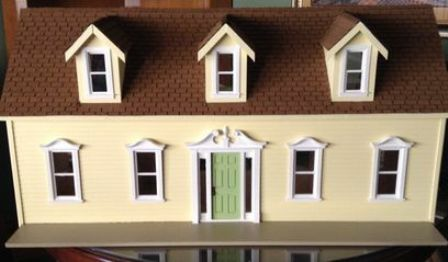 The windows and doors are not glued in place to make decorating easier. Painted a soft yellow with an apple green door. Porch is painted tan to match the asphalt shingles. Interior is unpaiinted so you can decorate to your hearts content. Shipping costs can be caluculated upon request but due to the size and weight of this house, will be considerable. Delivery is available within a 100 mile radius, Ask us about costs.